Nationality: Swiss. Born: Maria Margarethe Anna Schell in Vienna, Austria, 5 January 1926; sister of the actor Maximilian Schell; became Swiss citizen. Education: Attended a convent school in Colmar, Germany; business school in Switzerland; School of the Theatrical Arts, Zurich. Family: Married 1) the director Horst Hächler, 1957; 2) the stage director Veit Relin, 1966. Career: 1942—film debut in Der Steinbruch ; then acted on Swiss stage; 1946—member of the State Theater of Bern; film contract with Alexander Korda; continued to act on stage: in Faust opposite Albert Bassermann on European tour; 1958—first U.S. film, The Brothers Karamazov ; 1980—in TV mini-series The Martian Chronicles , Inside the Third Reich , 1982, and Der Clan der Anna Voss , 1995. Awards: Best Actress, Cannes Festival, for Die letzte Brücke , 1954; Best Actress, Venice Festival, for Gervaise , 1955; Deutscher Filmpreis Career Award, 1977. Die Kostbarkeit des Augerblicks, Gedanken Erinnerungen , Munich, 1985. In Seventeen Interviews , by Edwin Miller, New York, 1970. Spaich, Herbert, Maria Schell: Ihre Filme—ihre Leben , Munich, 1986. "The Golden Look" (cover story), in Time (New York), 30 December 1957. Current Biography 1961 , New York, 1961. Spelman, F., "The Explosive Schell Family," in Show (Hollywood), January 1963. Throughout the 1950s, Maria Schell dazzled rows of moviegoers in Europe and Great Britain with a series of extraordinarily moving performances. German audiences, who were especially enamored of her intense portrayals of unjustly suffering women, voted Schell their favorite actress in 1951, 1952, 1954, 1955, and 1956. Critical tongues likewise wagged approbation, frequently citing Schell's instinctual talent as an actress, the emotional range of her acting, and her goldstruck beauty. Recognizing that her presence in a film could help assure its commercial and often critical success, filmmakers throughout Europe cast Schell in nearly 25 films before 1960. Her role as a central character would also cancel the need for dubbing as Schell spoke five languages. After her critical successes in Die letzte Brücke and Gervaise , MGM acknowledged Schell's abilities and the healthy box-office receipts of her films by inviting her to appear in The Brothers Karamazov as Grushenka, a coveted role for which Marilyn Monroe had originally been considered. Schell's arrival in Hollywood provoked both enthusiastic speculations on her becoming the newest international screen star, and favorable comparisons with Ingrid Bergman who had captured Hollywood in the 1940s. But, a brief series of miscastings, including her performance as Grushenka, revealed the potential weakness of box-office casting and soured Schell's three years in Hollywood. The miscastings only highlighted her shortcomings and misused her strengths. As Grushenka, Schell reduced the complexity of Dostoevsky's character to a frustrating ambiguity, replete with a nervous giggle. For MGM's remake of Cimarron , Schell undermined the role of Sabra Cavet through a number of inexplicable acts such as repeatedly flashing the famous Schell smile while in childbirth. 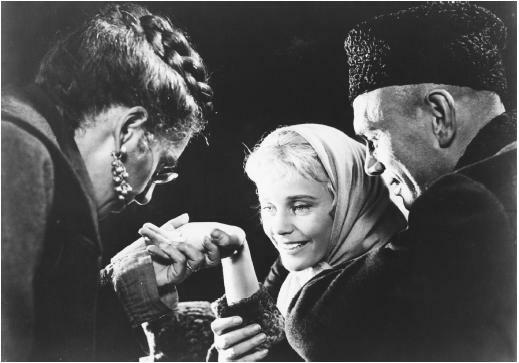 Critical response to Schell had so deteriorated by the early 1960s that, despite her strong performance in Le notti bianche , Bosley Crowther would write in a review of the film, "Miss Schell is enough to blunt one's perceptivity to the poetry and meaning of the [film's] theme." The additional waning of her popularity with the moviegoing public induced Schell in 1963 to leave film and work full-time in the theater, where she had begun her career as an actress. Schell returned to motion pictures in 1968, once again as an international performer, to play a diversity of roles, including a cameo appearance in Superman .